My dear sweet Jasmine almost died this week. She came down with Bottle Jaw. 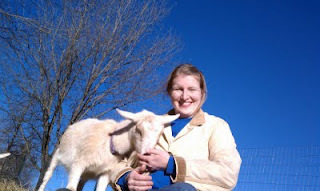 Basically the over the counter wormers don't work in our area (humid, wet, warm, lots of goats), and despite worming my goats regularly, she was so infested with worms her cells could no longer hold fluid. Spent 20 hours chasing down injectable B12, injectable iron, stronger wormer, fresh bedding and new hay. Then I bleached all the food bowls, dug out the barn, put down fresh bedding, and worried and worried and worried. My kids prayed for her at bed time. I lost sleep. Today she is still too weak to walk, but looking less swollen and eating well. She has abandoned the introspective gaze of the gravely ill and is looking more like a convalescent. So on my way to running a sustainable, organic, crunchy farm I am learning that life is a compromise. Can you live "naturally?" Sure, but nature is brutal, and I would have to be willing to let the weaker things in my sphere die. I am just not ready for that. Are Nigerian Dwarf Goats a weaker breed because we pamper them? Yep...but I love my Jazzy Belle. Sorry, nature. Maybe next year.